Australia's greyhound racing history is littered with some great canine champions. From the mighty Chief Havoc to the legenday Zoom Top, latter day champions such as Flying Amy and Brett Lee, greyhound racing fans have been blessed to witness the racetrack deeds of some true champions. And one champion who stands tall is the might Rapid Journey. 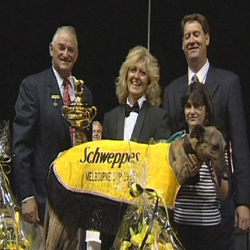 Home bred by John and Jane Carruthers, 'Carl' reached the dizzy heights of canine immortality, and in 2010 still holds the record for the highest amount of prizemoney ever earnt by a greyhound anywhere in the world. From the moment he stepped on to a racetrack and won his maiden event at Taree on the mid-North Coast of NSW, he showed above average ability, but surely no-one, not even the Carruthers' could have dreamt of the success that they were to experience. Rapid Journey etched his name into the record books for the first time when winning the Group 1 Adelaide Cup, and in the space of just 11 months, he would add another 5 Group 1 titles to his resume, in the process breaking nearly every record in Australian greyhound racing history. In the 1998 Golden Easter Egg he was sent out an 11/8 favourite and duly saluted, cliaming what was in the late 1990's the massive $100,000 first prize cheque, before venturing across the nullabor to add the Perth Cup to his burgeoning tally. In August 1998 Rapid Journey returned to home soil to take out the State final of the National Sprint Championship before heading back to the golden West to take on the cream of the nation's greyhound racing talent. It's now forever written in Australian greyhound racing history that Rapid Journey's victory was one of the most amazing ever seen on a racetrack. Beginning only moderately from Box 6, he suffered a pummelling in the early stages and was a distinct last as the field entered the back straight in the 530 metre race. Producing a whirlwind finish, he weaved his way through the entire field, secured a clear run in the home straight, eventually scoring a runaway victory against some of the best greyhounds on offer. This was Rapid Journey at his brilliant best. By now he had won an unprecedented 4 Group 1 titles insuccession and number 5 came in the shape of another brilliant victory in the Melbourne Cup held at Sandown Park in November 1998. Amazingly, bookmakers took a set against the champ and bet the luxurious odds of 5/2 after he had drawn the brown rug of box 6. The pay-out line for the bookies stretched for a long way as the faithful lined up to collect. Just two weeks later, Sandown Park would be Rapid Journey's swansong on a racetrack. After drawing Box 1 in the final of the Topgun, Rapid Journey produced anothers guts and all performance to secure his own piece of greyhound racing history. The winning time was 29.85, and the $70,000 first prize saw him emulate the legendary American chaser, Mo Kick, as the highest stakes-winner in the world. It was also Group 1 title number 6, and for punters, this would be the last time they would ever see the great Rapid Journey produce his magic on the track as he was retired to Stud immediately after his Topgun victory. Inducted into the Australian Greyhound Racing Hall of Fame, Rapid Journey later left his legacy in the breeding barn, but sadly he passed away in 2010 at the property of John and Jane Carruthers. He may be gone but his records will stand the test of time. Rapid Journey proved without a shadow of a doubt that he is the benchmark when it comes to champions, and he will forever be remembered in Australian greyhound racing history as one of the greatest chasers of all time.